Rinzai Zen monks of Nanzenji Temple, Kyoto. You've heard of Zen. You may even have had moments of Zen—instances of insight and a feeling of connectedness and understanding that seem to come out of nowhere. But what exactly is Zen? The scholarly answer to that question is that Zen is a school of Mahayana Buddhism that emerged in China about 15 centuries ago. In China, it is called Ch'an Buddhism. Ch'an is the Chinese rendering of the Sanskrit word dhyana, which refers to a mind absorbed in meditation. "Zen" is the Japanese rendering of Ch'an. Zen is called Thien in Vietnam and Seon in Korea. In any language, the name can be translated as "Meditation Buddhism." Some scholars suggest that Zen originally was something like a marriage of Taoism and traditional Mahayana Buddhism, in which the complex meditative practices of Mahayana met the no-nonsense simplicity of Chinese Taoism to produce a new branch of Buddhism that is today known the world over. Be aware that Zen is a complicated practice with many traditions. 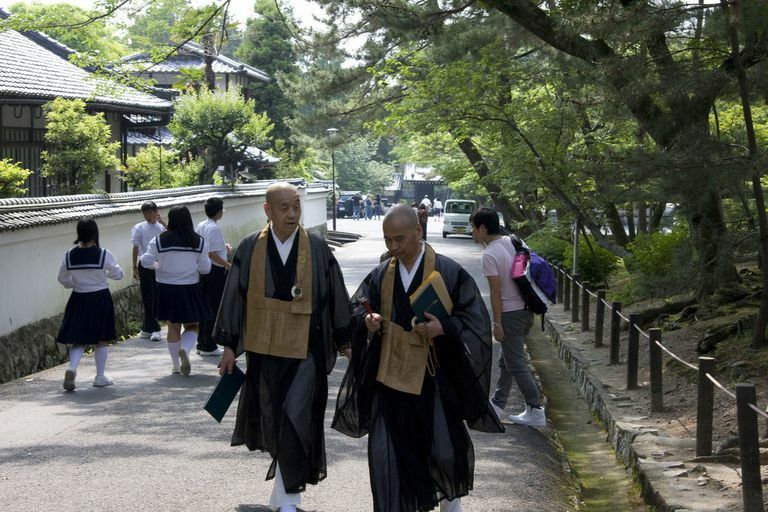 In this discussion, the term "Zen" is used in a general sense, to represent all different schools. Zen began to emerge as a distinctive school of Mahayana Buddhism when the Indian sage Bodhidharma (ca. 470–543) taught at the Shaolin Monastery of China. (Yes, it's a real place, and yes, there is a historic connection between kung fu and Zen.) To this day, Bodhidharma is called the First Patriarch of Zen. Bodhidharma's teachings tapped into some developments already in progress, such as the confluence of philosophical Taoism with Buddhism. Taoism so profoundly impacted early Zen that some philosophers and texts are claimed by both religions. The early Mahayana philosophies of Madhyamika (ca. third century A.D.) and Yogacara (ca. third century A.D.) also played huge roles in the development of Zen. Under the Sixth Patriarch, Huineng (638–713 A.D.), Zen shed most of its vestigial Indian trappings, becoming more Chinese and more like the Zen we now think of. Some consider Huineng, not Bodhidharma, to be the true father of Zen since his personality and influence are felt in Zen to this day. Huineng's tenure was at the beginning of what is still called the Golden Age of Zen. This Golden Age flourished during the same period as China's Tang Dynasty, 618–907 A.D., and the masters of this Golden Age still speak to the present through koans and stories. During these years, Zen organized itself into five "houses," or five schools. Two of these, called in Japanese the Rinzai and the Soto schools, still exist and remain distinctive from each other. Zen was transmitted to Vietnam very early, possibly as early as the seventh century. A series of teachers brought Zen to Korea during the Golden Age. Eihei Dogen (1200–1253) was not the first Zen teacher in Japan, but he was the first to establish a lineage that lives to this day. The West took an interest in Zen after World War II, and now Zen is well established in North America, Europe, and elsewhere. Seeing into one's nature and attaining Buddhahood." Zen is sometimes said to be "the face-to-face transmission of the dharma outside the sutras." 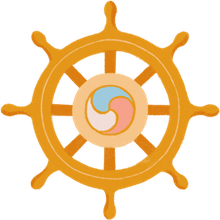 Dharma refers to the teachings, and sutras, in a Buddhist context, are sacred texts or scriptures, many of which are considered to be transcriptions of the oral teachings of the Buddha. Throughout the history of Zen, teachers have transmitted their realization of dharma to students by working with them face-to-face. This makes the lineage of teachers critical. Genuine Zen teachers can trace their lineage of teachers back to Bodhidharma, and before that to the historical Buddha, and even to those Buddhas before the historical Buddha. Certainly, large parts of the lineage charts have to be taken on faith. But if anything is treated as sacred in Zen, it's the teachers' lineages. With very few exceptions, calling oneself a "Zen teacher" without having received a transmission from another teacher is considered a serious defilement of Zen. Zen has become extremely trendy in recent years, and those who are seriously interested are advised to be wary of anyone proclaiming to be or advertised as a "Zen master." The phrase "Zen master" is hardly ever heard inside Zen. The title "Zen master" (in Japanese, zenji) is only given posthumously. In Zen, living Zen teachers are called "Zen teachers," and an especially venerable and beloved teacher is called roshi, which means "old man." Bodhidharma's definition also says that Zen is not an intellectual discipline you can learn from books. Instead, it's a practice of studying the mind and seeing into one's nature. The main tool of this practice is zazen. The meditation practice of Zen, called zazen in Japanese, is the heart of Zen. Daily zazen is the foundation of Zen practice. You can learn the basics of zazen from books, websites, and videos. However, if you're serious about pursuing a regular zazen practice, it is important to sit zazen with others at least occasionally; most people find that sitting with others deepens the practice. If there's no monastery or Zen center handy, you might find a "sitting group" of laypeople who sit zazen together at someone's home. As with most forms of Buddhist meditation, beginners are taught to work with their breath to learn concentration. Once your ability to concentrate has ripened (expect this to take a few months), you may either sit shikantaza—which means "just sitting"—or do koan study with a Zen teacher. Why Is Zazen So Important? As we find with many aspects of Buddhism, most people have to practice zazen for a while to appreciate zazen. At first you might think of it primarily as mind training, and of course, it is. If you stay with the practice, however, your understanding of why you sit will change. This will be your own personal and intimate journey, and it may not resemble the experience of anyone else. One of the most difficult parts of zazen for most people to comprehend is sitting with no goals or expectations, including an expectation of "getting enlightened." Most people do sit with goals and expectations for months or years before the goals are exhausted and they finally learn to "just sit." Along the way, people learn a lot about themselves. You may find "experts" who will tell you zazen is optional in Zen, but such experts are mistaken. This misunderstanding of the role of zazen comes from misreadings of Zen literature, which is common because Zen literature often makes no sense to readers intent on literalness. It isn't true that Zen makes no sense. Rather, "making sense" of it requires understanding language differently from the way we normally understand it. Zen literature is full of vexatious exchanges, such as Moshan's "Its Peak Cannot Be Seen," that defy literal interpretation. However, these are not random, Dadaist utterings. Something specific is intended. How do you understand it? Bodhidharma said that Zen is "direct pointing to the mind." Understanding is gained through intimate experience, not through intellect or expository prose. Words may be used, but they are used in a presentational rather than a literal way. "The presentational mode of communication is very important in Zen Buddhist teaching. This mode can be clarified by Susanne Langer's landmark book on symbolic logic called 'Philosophy in a New Key.' She distinguishes between two kinds of language: 'Presentational' and 'Discursive.' The presentational might be in words, but it might also be a laugh, a cry, a blow, or any other kind of communicative action. It is poetical and nonexplanatory—the expression of Zen. The discursive, by contrast, is prosaic and explanatory....The discursive has a place in a Zen discourse like this one, but it tends to dilute direct teaching." No secret decoder ring will help you decipher Zenspeak. After you've practiced awhile, particularly with a teacher, you may catch on—or not. Be skeptical of explanations of koan study that are found on the internet, which are often peppered with academic explanations that are painfully wrong, because the "scholar" analyzed the koan as if it were discursive prose. Answers will not be found through normal reading and study; they must be lived. If you want to understand Zen, you really must go face the dragon in the cave for yourself. On the other hand, for such a small sect, Zen has had a disproportionate impact on the art and culture of Asia, especially in China and Japan. Beyond kung fu and other martial arts, Zen has influenced painting, poetry, music, flower arranging, and the tea ceremony. Ultimately, Zen is about coming face-to-face with yourself in a very direct and intimate way. This is not easy. But if you like a challenge, the journey is worthwhile. Aitken, Robert. The Gateless Barrier. North Point Press, 1991.